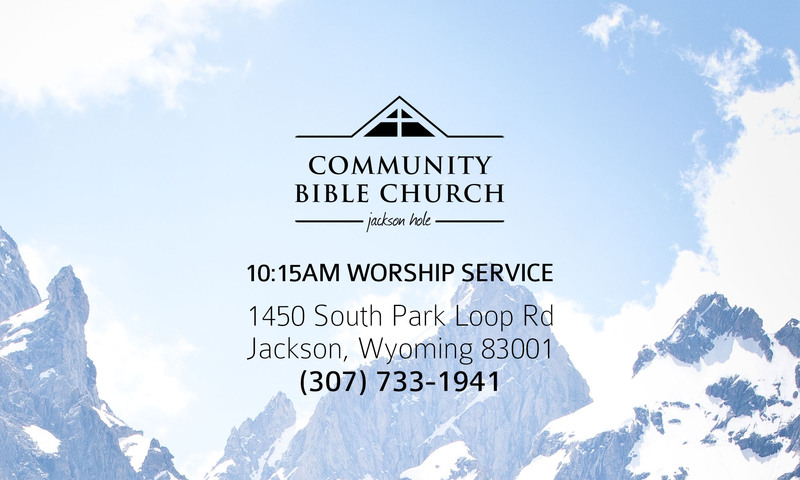 Community Bible Church is the head of several key ministries including Jackson Hole Bible College and Jackson Hole Christian Academy. To donate towards JHBC, please visit www.jhbc.edu. To donate towards JHCA, please visit www.jhchristianacademy.org. Donate towards CBC via the “Donate” button below, and on the review donation page in the checkout process you can type the destination of your donation in the field labeled “Choose destination: RMM / CBC / General”. “RMM” = Rocky Mountain Ministries, “CBC” = Community Bible Church, “General” = wherever the staff deems important. Thank you for partnering with our ministry! We at Community Bible Church strive to handle the Scripture with the utmost importance and accuracy. We believe the Bible is the plenary written infallible Word of God. We believe the Bible was given to us from God to be the tool that guides us through everyday life. We aim to get members invovled in the church to use their spiritual gifts and talents. Our goal is to be a light in our community so that we can spread the Good News. Jackson Hole Bible College is held on the grounds of Rocky Mountain Lodge. JHBC was established in 1997. Committed to standing unwaveringly on the authority of Scripture, the college is founded on creationism, classical dispensationalism and Biblical inerrancy. It is our goal to provide students with a biblical worldview and a solid foundation upon which to build their lives. If you would like more information on JHBC just visit the website at www.jhbc.edu. Jackson Hole Christian Academy is a K-12 school held on the church grounds. JHCA was established in 1988. The current curriculum being used at the school is A Beka Book. If you have any questions about the school, please contact the church office at (307) 733-1941. For more information visit www.jhchristianacademy.org. Our sunday school for adults and teenagers meets every Sunday at 9:00am and ends at 10:00am. There is also sunday school provided for kids during this time while parents attend F.B.I. Adults are currently doing a Precepts study through 1 Thessalonians. Youth group is every Wednesday night from 7:00pm-9:00pm. Ages allowed are from 6th-12th grade. Includes Bible studies, prayer time, and fun activities. Please call (715) 490-0161 to contact our youth group leader Tim Thornton if you have any questions or would like to join their private Facebook group page.